Dyslexic Solutions Ottawa provides intensive, one-on-one reading remediation for students who, despite being exposed to mainstream reading instruction, continue to struggle to develop their reading and writing skills. We use the Barton Reading and Spelling System, which is one of the most reputable Orton-Gillingham based systems there is. The Barton Reading and Spelling System® is a scientifically research-based reading and spelling (and multi-sensory phonics) tutoring program. Its extensive curriculum is designed specifically for students struggling with reading and spelling challenges, due to language-based learning disabilities, or dyslexia. Leading expert in the field of dyslexia, Susan Barton, developed this program. Ms. Barton has been inducted into the International Dyslexia Association’s Hall of Honor. The Barton Reading and Spelling System® is an intensive tutoring program, based upon the Orton-Gillingham approach to reading instruction. In order to achieve success, dyslexic readers need to be taught the phonemic structure of language with patience and empathy – slowly and systematically. Using coloured tiles and explicit, multi-sensory phonics instruction, students progress at their own pace. Learning in this manner enables students to strengthen their reading accuracy, spelling, and comprehension skills. To enhance results further, each skill is taught in a particular and sequential order, so that each lesson builds on the previously learned skills. Tutoring sessions are highly interactive and engaging. The student is given constant feedback and guidance as he or she masters each skill. Diagnostic teaching strategies are implemented as students receive positive and constructive feedback throughout each lesson. It is recommended that students be tutored at a minimum of two hours per week. This regularity forms an essential component to building the neural circuity associated with reading, thus closing the gap between the dyslexic reader and his or her grade-level peers. Commitment and consistency are the keys to success. Please don’t anticipate a quick fix. It can take at least two to three years to progress through and complete the Barton Reading and Spelling System® in its entirety (that’s all 10 levels). Skipping a level is not recommended, even if it may seem trivial. Since each level builds upon the previous, it is absolutely vital they all be followed – thoroughly. 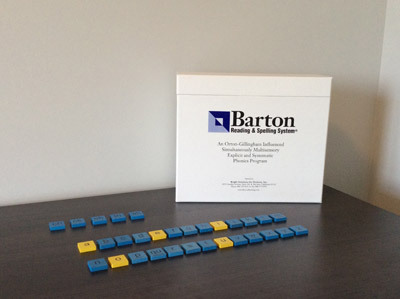 The Barton Reading and Spelling System® is an Orton-Gillingham-Influenced Simultaneously Multisensory Explicit and Systematic Phonics program. Studies show that effective phonics programs must be taught both explicitly and systematically (Shaywitz, 2003). The Orton-Gillingham method incorporates these features, plus many more, and the benefits are tremendous. The Orton-Gillingham Approach – What is Taught and How? Multi-sensory learning engages all of the senses – visual, auditory, and kinesthetic-tactile. This approach enhances memory and learning, making it easier to store and retrieve that information later. The student is taught mnemonic devices (i.e., the use of a pattern of letters, ideas or associations that assists in memory), movements, and/or hand gestures to help with memorization of sound-symbol relationships and spelling rules. The Barton Reading and Spelling System® uses colour-coded tiles, which the student is able to touch and manipulate, to break apart and build words. Unique letter combinations are coded by colour to increase sound-symbol knowledge/recognition. The multi-sensory phonics program and teaching approach engages all senses simultaneously to enhance learning and memory. For example, when learning the spelling of an unfamiliar sight word that must be memorized, the student might read the word (visual), say each letter out loud (verbal/auditory), use his or her finger to write the letter in the air, and print the letter on paper (kinesthetic/tactile). Thus, all senses are engaged simultaneously, to reinforce learning. Explicit instruction is clear and direct, leaving no room for confusion or guessing (Shaywitz, 2003). Decoding strategies are taught directly. It is important to note that reading and writing are not instinctive processes. Students must be taught to associate letters with their sounds and to blend those sounds together to form words, and break apart those sounds to spell words. Whereas a “whole-language” approach to reading instruction assumes that reading will be acquired naturally through mere exposure to print, an explicit approach requires that students be instructed to analyze a word and sound it out. The Barton Reading and Spelling System® explicitly teaches the student all spelling rules that influence the English language – one at a time – learning why similar sounds have different spellings, and when to apply the rules appropriately. Students explicitly learn how to tackle unfamiliar words when reading and spelling, as all concepts are directly taught to the student through ongoing interaction with the tutor. Systematic instruction requires that content be introduced to the student in a sequential, logical manner. When a child reads, he or she converts letters into sounds, and the process of acquiring such knowledge is orderly and follows a specific sequence (Shaywitz, 2003). Prior to letter-sound associations being taught in the Barton Reading and Spelling System®, the student builds phonemic awareness skills, which are a prerequisite to both reading and spelling. The student is provided ample opportunity to reinforce basic reading and spelling skills. There is a gradual, systematic increase in the sounds, words, and stories that are read. Letter and sound combinations are introduced to students in a progressive and logical manner – from the most simple and frequent to the more complex and uncommon. These skills are repeatedly practiced and mastered before moving on to more complex material, or the next level in the program. Parents now have the solution to their child’s language-based learning disability, offering relief from frustration – for both them and the child. There’s little room to doubt its true value as an essential multi-sensory phonics program and tool in the process of helping a child through the reading challenges Dyslexia presents. Results have proven the efficacy of employing the Barton Reading and Spelling System® time and time again. For parents or teachers interested in using and implementing the Barton Reading and Spelling System® with their own children or students, please don’t hesitate to contact me. I’m happy to answer questions about the program, and to provide feedback related to effective implementation.